Without doubt, as the highlight of 2016 WWDC, iPhone 7 pros received more and more attention from Apple fans. For making your new iPhone 7/Plus more special, I strongly suggest you to personalize iPhone 7/ Plus ringtone, especially Apple announced that iPhone audio now is in stereo, which owns new stereo speaker system, 2X louder than iPhone 6s and both earpods with lightning connector and Airpods. But how to make ringtone for iPhone 7 with ease? Don't worry! Here we give you a detailed guide and share you tips to transfer songs to the new smartphone without any further ado. MacX MediaTrans, as its suggests, is an iPhone manager in essence. What's beyond your imagination is that it also delivers a perfect performance in iPhone 7 ringtone making, letting you directly trim any music and custom it with simple mouse clicks, all by itself. You are also free to transfer songs from your computer to iPhone 7/Plus as ringtone with whatever audio format, for this all-sided iPhone Ringtone maker has auto-audio converting feature to automatically convert any music audio to iPhone ringtone format AAC with a wink. It's also a stronger performer in music management (sync music between Mac and iPhone iPad; delete unwanted music in batch; create playlists, batch edit artist info, etc.). Plus, you are at will for iPhone video backup, photo transfer, iBooks management and take iPhone as USB hard drive mounting, etc. Preparation Work: Mac computer (Mac OS X 10.7-10.13 macOS High Sierra); iPhone 7/7 Plus iOS 10; USB cable; iTunes 12.3 or above version. Particularly illustration: here we only need to install iTunes 12.3 or above version to detect your iPhone and read information. So those users who are sick of iTunes complication and instability, please don't worry, the whole iPhone ringtone making procedure will not use iTunes. Free download and launch it on your Mac. Connect your iPhone 7 or iPhone 7 Plus to Mac; it will automatically recognize your iPhone and suggest you to properly adjust iTunes settings to prevent data erasing automatically. Please do as it says. Press "Music Manager" on the main interface and you will see all your music songs are listed on the right side and the album categories are organized on the left side. Select your desirable music and point your mouse to it. Hit "Click to Make Ringtone" to enter the window. Step 3: Free move the lines shown on the above picture to trim music at your will. The duration of iPhone ringtone is kept with 40 seconds. Step 4: Click "OK" and go back to main interface. Click "Voice & Ringtone" to check if your ringtone is successfully created. Note: In terms of format selection, please go back to "Settings" in main interface → Click "Option" and you will see "Auto convert music format to MP3 or AAC" option. It will automatically convert any audio music to MP3, AAC, that iPhone supports. Send ringtones to iPhone from Mac, in two ways. 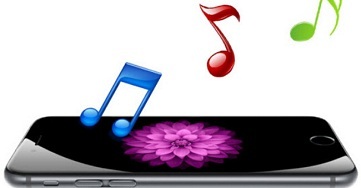 Some experienced Apple iPhone users believe that downloading free ringtones is a piece of cake. They can jailbreak their newly purchased iPhone 7/6s/6s Plus and then download a useful iOS app to save some exclusive songs in MP3, M4A, AAC etc. It seems so easy, but many potential safety hazards will be taken from jailbroken iPhone. Thus, reconsider cautiously before you do so. For the sake of successfully downloading ringtone on iPhone 7/6s/6, you are highly recommended to use the functional music downloader- MacX Video Converter Pro. It is able to effortlessly download iPhone songs in MP3 from more than 300+ online music & video sites, like Soundcloud, Pandora, music.yahoo, audiomack, Myspace, etc. with high audio quality reserved. What's more, it also can help you to download amazing music video from YouTube, Facebook, Dailymotion, Vimeo, Vevo, etc so that you can aim for later ringtone creation. Follow the below guide. Prior to iPhone 7 ringtone download, you should free download it on your Mac (macOS Sierra/El Capitan included). If you are a Windows user, you ought to download Windows version. Step 1: Launch this tool and then find desired music from YouTube, Pandora, music.yahoo, audiomack or SoundCloud. Copy and paste the music URL to the box frame. Step 2: Choose the format. By the way, you are also allowed to download music video with MP4, FLV, WMV, etc for later audio track extracting. Step 3: Specify the destination folder on your computer to save the file by clicking "Browse" button. Step 4: Click "Download Now" to start iPhone 7 ringtone download process. BTW, this tool also can download movies to iPhone for free enjoyment. Some people complain that it's hard to find free ringtones to download or don't have any idea about good ringtones. It doesn't matter; we list some great songs for your consideration. You can easily download them from YouTube and convert to iPhone supported ringtone formats with the aid of the above-mentioned software.